So I'm testing this super-cool Lenovo system that would make a perfect media center for the den. It's an all-in-one, meaning there's no bulky tower--just a screen, a base, and a wireless keyboard and mouse. What it's missing, however, is a remote, which is shame given that it has a built-in TV tuner. How am I supposed to kick back on the couch without a clicker? Smartphones to the rescue! 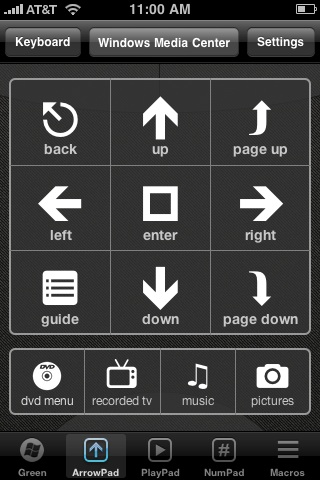 Thanks to apps like HippoRemote (shown below), I can use my iPhone (or iPod Touch) to control my PC from across the room. How does it work? Both my PC and iPhone are connected to the same Wi-Fi network. After installing a small (and free) Windows utility, the app is able to connect to the system and work its magic. HippoRemote gives me not only a virtual touchpad and keyboard, but also a screen's worth of Windows Media Center controls that fully approximate an actual remote. Well worth the $1.99 price tag. Android users can get in on the PC-remote action with apps like Gmote, which is donationware. Alas, I haven't found anything comparable for BlackBerry. If you know of a good PC-remote app for that platform, tell me about it in the comments. Now if you'll excuse me, I'm going to kick back for a little Windows Media Center-powered Netflix-on-demand.